Welcome to Chile - miles of mountains! The Andes they told me. 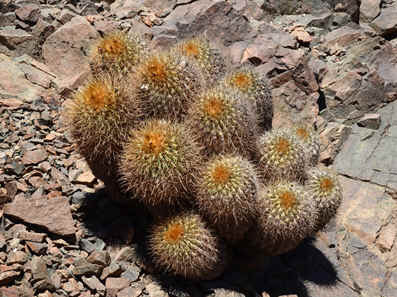 I was lucky to go on a cactus tour of Argentina and Chile last winter. We visited the sites of many rare and interesting cacti, the bus would stop and Guillermo our leader would indicate a few of the local species so that we would know what we were looking for. Then we wandered around finding and photographing the plants and scenery. Just about all the plants were a short walk from the bus though some were up (or down) precipitous slopes. Among the species I really, really wanted to see was Copiapoa krainziana and I knew we would have to walk some way for that one. With its long, twisting, glassy spines it is distinctive and desirable species, even in a genus of real cactophiles’ cacti. Approaching the coast of Chile we drove for hours across the most barren desert I have ever seen. No visible plants for miles and only the distant volcanic terrain for entertainment. 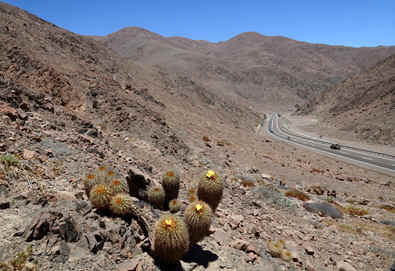 The Atacama is a serious desert with zero recorded rainfall for many years, It has a claim for the driest in the World. East of Paposo we made our first cactus stop for twenty-four hours; yes we were getting a bit twitchy! 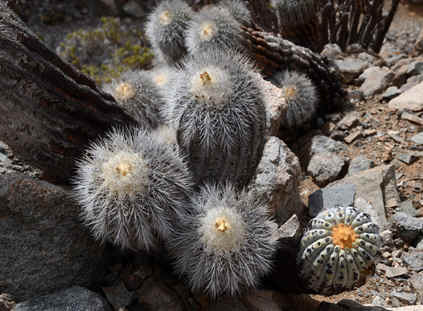 On our descent from the Andean foothills beautiful plants of Copiapoa cinerea ssp. 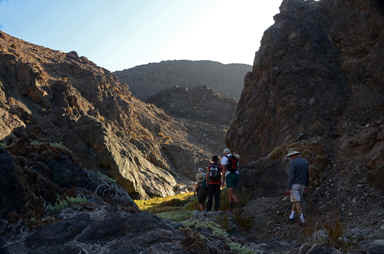 haseltoniana, (the form that used to be called 'eremophila'), were scattered across the steep sides of the rocky valley. 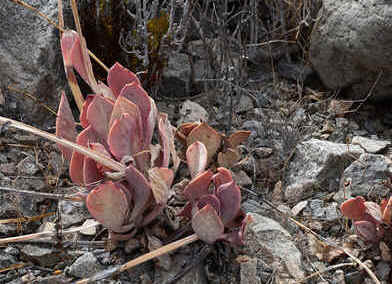 How can these plants survive in the desert with so little rain? The answer lies in ‘camanchaca’, the fog that sweeps in from the cold Pacific Ocean to saturate the hills with dew. The fog sustains islands of vegetation with many species that have evolved to utilise this form of water. Next, on cliffs overlooking the sea, we were to see many species of cacti, Copiapoa, Eriosyce and Eulychnia breviflora, the last draped in lichens and air-plant bromeliads. Early next day we left our hotel at Taltal and were soon at the entrance to the Quebrada San Ramon, home to Copiapoa krainziana and, as it turned out, a plethora of interesting plants. Friends had suggested that I might struggle on this hike, a steep ascent, a long walk, rocky terrain, carry gallons of water, you know the horror stories. Since all ten paying guests set out on the walk, including several octogenarians, I could see no harm in giving it a try. The hike started on a ‘fossil’ raised beach. This part of the world has been steadily rising and all along the coast were traces of old beaches at different elevations that had been formerly at sea level. I suppose if the uplift was sudden the jolt might trigger a tsunami; there were plenty of warning signs as to the emergency evacuation routes from the coast. 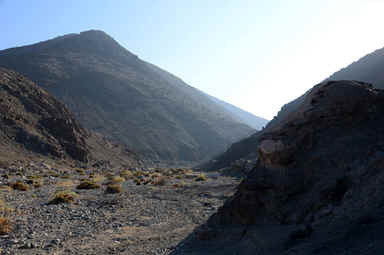 The trail to such a famous cactus was somewhat inauspicious, starting through the Taltal town rubbish dump. We quickly left this sign of civilisation behind and soon the sides of the Quebrada started to close in. You knew, of course, that ‘quebrada’ is a ravine. It was a lovely day for a walk, bright and cool. Perish the thought that we would set out to see krainziana in the fog, that must be frequent here, or even worse, rain! 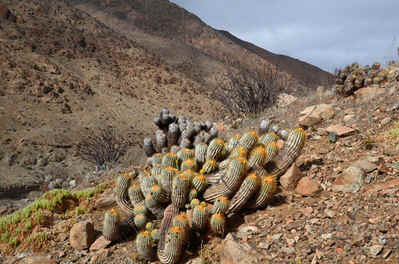 Above: Two views in the Quebrada San Ramon Above; Copiapoa cinerea near the start of the hike. There were fabulous plants of Copiapoa all around, even in the rubbish dump. Here I have to admit my ignorance; though I was told the names of the species that grew here, there was so much variation putting the correct name to the plants was a bit of a guess. But I have! These I thought were Copiapoa tenebrosa. 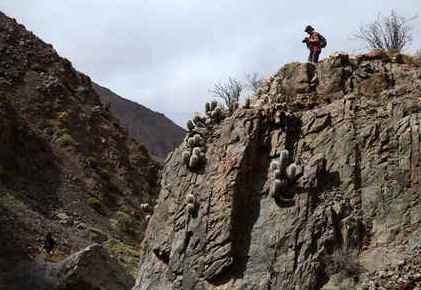 We climbed steadily upwards pointing our cameras at all the best clusters and spectacular plants. If there were any small growing species there I would not have seen them. I cherry-picked the big’uns. 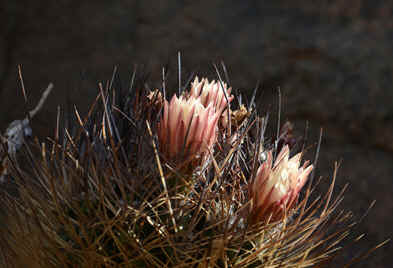 I took pictures of Copiapoas with all manner of colour and length of spines, even spineless specimens. These were a mixture of C. tenebrosa and C. gigantea. Right: Copiapoa gigantea in the foreground. Something else behind. Left: A Calandrinia looking like Adromischus (until it flowers). 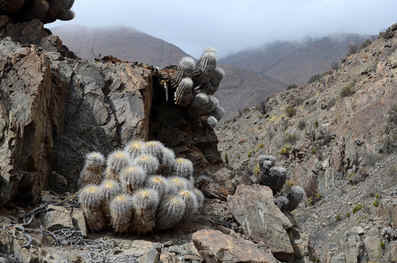 Middle: Copiapoa krainziana growing on a vertical rock face. Right Copiapoa krainziana with a view down the Quebrada San Ramon. Note the mist over the hill in the distance. Eventually I saw, in the distance, the rock bluff that featured in friends’ pictures and the home of Copiapoa krainziana. With quickened pace, (that walk wasn’t so bad after all), I hurried up to see the plants. They were magnificent! Clusters with long glistening spines were hanging from the rocks. Were the best plants above that cliff? Oh well, here we go! 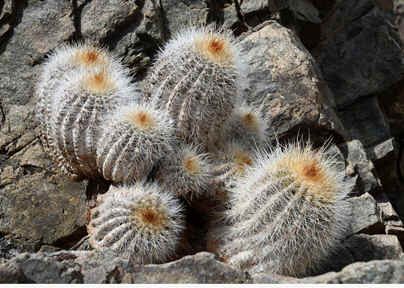 Left and Middle: Plants of Copiapoa krainziana but note the C. gigantea adjacent in the middle image. 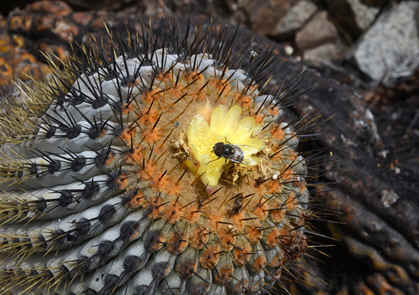 Right: Copiapoa gigantea with a pollinating bee flying from flower to flower and complicating the taxonomic situation in the Quebrada. We spent about a quarter of an hour scrambling up and down the rocks to get pictures of the best plants and angles and I rate that time among the best habitat cactus experiences in my life, (and I have seen a lot of very rare American cacti). Classic krainziana was mixed with gigantea, although we saw plenty of the last in flower I saw no krainziana in flower. That was perhaps the only negative of the morning. In the afternoon we went on to see acres of Copiapoa columna-alba, more C. cinerea and C. rupestris, a pretty good day really. 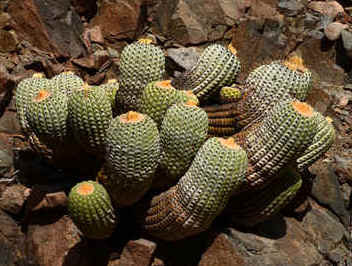 You probably know that ‘tenebrosa’ is now considered to be a form of Copiapoa cinerea and both C. gigantea and C. krainziana are varieties (in the modern style) of this species. So a very variable species in the Quebrada San Ramon as you might guess from some of the photos I took. 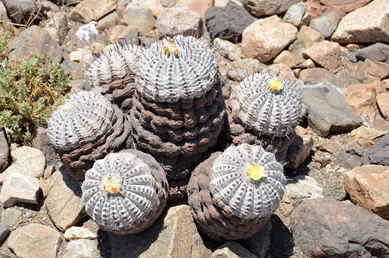 Copiapoa columna-alba is also a variety of cinerea. It took 4½ hours for the round trip taking photos of everything interesting. I kept 203 pictures taken on two cameras. I walked 9.98km (6.2 miles) with a climb of 280m (918 ft), and a few more on diversions up the slopes. Oh, and two more to capture the image of Eriosyce taltalensis.